As we have hit the ground running this summer, I had suggested SFK start a STEM Coach blog posting. This could be a way for parents to get a brief recap of the topics covered in their child’s week while also getting some feedback and opinion from the coaches. This week I was exploring “strong and stable” structures in Cary’s Civil Engineering Camp. 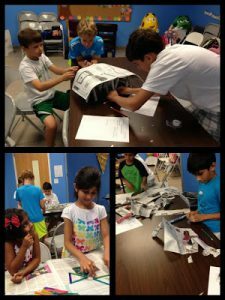 Throughout the week, we had campers from all grade levels determining the definition of “strong and stable.” Campers learned the concept of gravity and its effect on the buildings they see every day, as well as the impact various shapes have on civil structures. Using this same understanding, campers saw different examples of bridges and how they work. But putting the formal learning aside, campers engaged in an even more important skill–collaboration. Throughout the week campers had to work together in group to construct their structures. This gives them all a common goal and interest. When this happens campers (on their own) begin communicating with their peers about relevant civil engineer topics. From there the conversations expand to the structures they see everyday. An important common core standard being emphasized to educators is the ability for their students to discuss “relevant topics” in whatever grade level they are in. That is exactly what transpired during this week of camp. Pre-schoolers talking with fourth graders about the way arch bridge distribute weight is a very weird conversation to overhear. However, it demonstrated their understanding. On the end of the week surveys each camper takes, many of them commented that they enjoyed “making new friends,” or learned “how to make friends.” This networking component made this camp even more relevant to campers’ lives. So after many hot glue gun experiences (solely on my part), campers left with a better appreciation of the structures around them as well as the importance to communicate and work together.